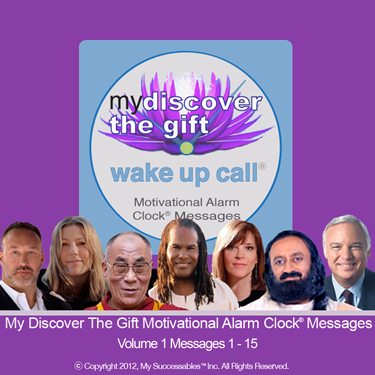 Wake UP to Discover Your Gifts and Live Your Purpose with His Holiness The Dalai Lama, Michael Bernard Beckwith, Jack Canfield, Marianne Williamson, Discover the Gift Movie Creators, Damien Lichtenstein and Shajen Joy Aziz, and many other renowned thought leaders! Morning Inspirations™ with HH The Dalai Lama and Other World Renowned Thought Leaders. 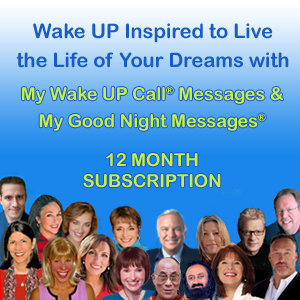 Wake UP inspired with messages from HH the Dalai Lama, Jack Canfield, Sir Ken Robinson, Michael Bernard Beckwith, Marianne Williamson, HH Sri Sri Ravi Shankar, David Wolfe, Janet Bray Attwood, Mary Morrissey, Mark Victor Hansen, Dr. Sue Morter, Discover the Gift filmmakers, Shajen Joy and Demian Lichtenstein, and other renowned thought leaders! Shajen Joy Aziz is Co-author and Co-Creator of Discover the Gift as well as a founding member of the Southern California Association of Transformational Leaders. Her expertise in education, mental health and human relations is has been cultivated during her career of over 20 years as a Master Educator. Shajen’s work focuses on emotions and systems and their impact on individuals’ ability to thrive personally, professionally, psychologically and spiritually. Shajen’s motto, “Learning for Lifeï¿½Empowering the Future” guides her as she pursues her passions and shares her gifts. She has shared the stage with other Transformational Leaders such as: Jack Canfield, Janet Bray Attwood and Chris Attwood, Michael Bernard Beckwith, Dr. Barbara De Angelis, Niurka, Christine Stevens, David Avocado Wolfe, and many more. She has a Bachelor’s Degree in Psychology and a Master’s Degree in Education. Demian Lichtenstein began his career as an off-Broadway child actor in NYC. By the age of 11 and while on his first movie set, Demian knew that he wanted to be a film director. He graduated as valedictorian from the prestigious High School of Art and Design and accepted the Rubenstein Scholarship to NYU’s Film School. After winning many awards like the MTV Best Video award, he began his career as a feature film director while also studying transformational leadership. His pursuits in the world of entertainment were matched only by his desire and passion to learn everything he could about the human spirit. From Native American sweat lodges to leading seminars in front of thousands of people, Demian went through an expanded search to discover the true meaning of metaphysics and transformation. After years in the trenches of Hollywood and propelled by a question posed by his sister, Shajen, Demian brought his two worldsï¿½filmmaking and metaphysical studyï¿½into DISCOVER THE GIFT: the movie, the book and the movement.